2018 Reissue with Bonus EP - Limited to 500 copies! Under the alias of Zanov we find the works of French electronic pioneer Pierre Salkazanov, who had started playing guitar in the 1960s in a Shadows styled band, Les Ambassadors. Instrumental rock was not enough for Salkazanov, he was always looking for evolution, so when a meeting with French synth player Serge Ramses (of "Secret" fame) got him into the world of synthesizers he just dived deep into the bourgeoning world of electronic music. He got himself an EMS VCS3 and started producing works into a 4-track Teac tape machine. French music was at its best, it was the time of Jean Michel Jarre, Didier Bocquet, Richard Pinhas and Heldon, Alain Meunier... Even Gong's Tim Blake was living in France at that time. By the time of his second LP, Moebius 256 301, issued also on Polydor in 1977, Zanov had already gathered a small collection of gear, including an ARP 2600 and an ARP sequencer, his old VCS3, an RMI Harmonic and a PS 3300. Again under the influence of both first and second generation of Berlin school musicians the LP will appeal to fans of Klaus Schulze or Tangerine Dream, but they will also find a big deal of Zanov's own personal sound on it, since as the musician himself reckons he had little contact with other peers of his generation, so besides a general love for the electronic gear used and the sounds you could make out of them the creative ideas behind his works were all his own. On his second album a richer sound is found, not only due to the use of the new gear, since some of its tracks where recorded using only his old EMS, but also due to his won experience after having taken his works to the life stages in the Golf Drouot boite, the Lase Olympia venue (on the basement of the famous Olympia), the Paris Planetarium or those for planned one month tour (of which in the end only four dates were accomplished). Zanov's three albums met with unanimous critical acclaim for the sound quality as well as for the originality of this very personal universe. 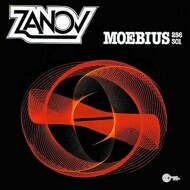 We offer the first ever vinyl reissue of Zanov's Moebius 256 301 under license from Pierre Salkazanov himself and with his cooperation, in a limited edition of 500 copies that reproduce its original artwork, come with remastered sound and an 8 page insert with liner notes and photos courtesy of www.audionautas.com plus one bonus 7" with previously unreleased on vinyl format material.